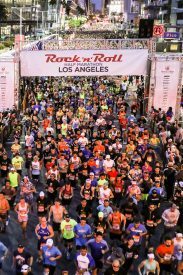 LOS ANGELES – Feb. 23, 2017 – Competitor Group, Inc. (CGI), operators of the Rock ‘n’ Roll Marathon Series, today announced an expanded relationship with United Airlines as the new title sponsor of the Rock ‘n’ Roll Los Angeles Half Marathon. The Halloween themed event, famous for thousands of runners dressed in costume, will welcome more than 15,000 participants to the streets of downtown Los Angeles the weekend of October 28-29, 2017. The Los Angeles sponsorship follows the recent announcement that United Airlines will also serve as the new title sponsor of upcoming Rock ‘n’ Roll Marathon Series events in Washington D.C. and San Francisco beginning in March 2017. Each event takes runners on a tour of America’s most iconic landmarks, featuring entertainment along the course and culminating with a finish line celebration and concert. Launched in 1998 in San Diego, Calif., the Rock ‘n’ Roll Marathon Series is famous for lining race routes with live bands and fanfare at 30 destination events worldwide. The Los Angeles race annually attracts more than 15,000 runners and will celebrate its eighth edition in 2017 with 5K and half-marathon races. The weekend kicks off with a two-day Health & Fitness Expo on Friday, Oct. 27 and Saturday, Oct. 28. The free expo is open to the public and will showcase the latest in running products, services and free samples from fitness experts as all registered runners pick up their race number, t-shirt and timing tag. Further information about the United Airlines Rock ‘n’ Roll Los Angeles Half Marathon can be found online at RunRocknRoll.com/Los-Angeles. The United Airlines Rock ‘n’ Roll Los Angeles Half Marathon will welcome more than 15,000 participants the weekend of October 28-29, 2017. Live bands and cheerleaders will entertain participants along every mile of the Halloween themed race, which starts and finishes in downtown Los Angeles and travels past many of the city’s landmarks. The race concludes with the Toyota Rock ‘n’ Roll Concert Series at the finish line. A two-day Health & Fitness Expo kicks off race weekend at the Los Angeles Convention Center on Friday, Oct. 27 and Saturday, Oct. 28. The free expo is open to the public and will feature the latest in running apparel and nutrition products. For more information or to register, please visit RunRocknRoll.com/Los-Angeles or follow @RunRocknRoll on Twitter.